I’ve had my injection and it was quite eventful! The waiting room was nice I got to meet a lovely little cat that reminded me of my friend Zoey . She’s paralysed from the tummy down and her mum was telling me all about her and their life. She was so tiny and really very sweet. There were also several what I call ‘toy’ dogs in there too. They are very popular here in Nice. They make me laugh though because I’m more than twice their size! 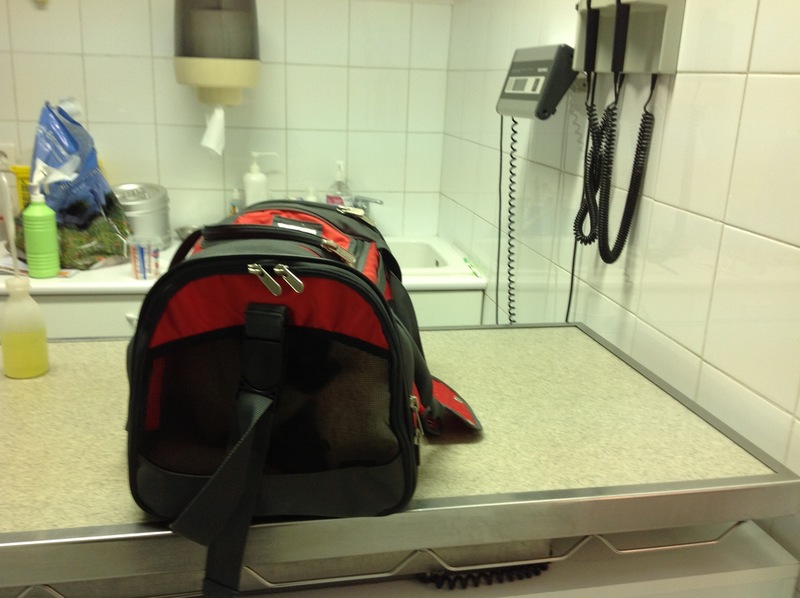 When it was our turn to go in, the vet started by weighing me. I now weigh 5.5 kg!!! He told mum he thinks I’m the most handsome cat he’s ever seen which I thought is a real complement coming from a vet! Then it was time for my rabies injection. Now I didn’t ask to have it and quite frankly I didn’t want it, so when the moment came I wasn’t exactly accommodating. The vet underestimated my strength and once the needle was in I made a break for it. This resulted in me running all around the table, according to mum, looking like I actually have rabies until he caught me again and could push all the yucky stuff inside me! Once that was over, I was even less impressed when he squirted something onto the back of my neck muttering something about flea protection. I’ve never had fleas – GET OFF!!! Mum has been to the doctor today too, because she’s a little under the weather and so she’s been eating her ‘go to’ comfort food, chicken soup. Since I was so well behaved brave I got to lick a little bit of the tin can! Yummy! But at least now my passport is all up to date for another six months until I have to go back for my vaccinations. Hooray! mum’s got it right….chicken soup’s the best after a day around needles and meds 🙂 quite outrageous the vet’s assumption you had fleas! or may be it was to keep them away ? Teddy would like you and your blue eyes to float on over to Nashville, Bailey! It’s time for TB to get his shots and I’ll tell him how brave you were to make him less nervous when he goes next week. YOW Bailey…me kin SO relate to you about goin to the Vet!!! Dey alwayz sayz me iz beeutiful n lubly n dere iz alwayz a needle somewhere….gggrrrrr….me iz proud of you fer givin da Vet a bit of xersize!!! dey need it!!! me getz dat flea stuff on da back of de neck frum Spring to Fall….it tinglez n me alwayz runz away but Mum iz guud at gettin it on me!! HHRRMMPPHH…on da ‘pawsitive’ side at least we iz healthy n flea free, right??? Dat little kitteh iz bery cute too!!! Wow, you are so gorgeous Bailey! Soup is yum, hope mum feels better soon. Chicken soup is a good cure all. Hope your mom feels better soon. Your ARE a beautiful cat Bailey. I love hearing of your adventures. You are the bravest cat I know. Most cats are afraid to leave their house. You ride in cars and on a BOAT! I am friends with Morris the Nine lives food cat. His mom/trainjer and my mom are friends. We share your post with them too. THIS IS FABULOUS, just discovered you and I am in love with your blog! I bet you’re glad that’s over with aren’t you Bailey?? The vet was right though in that you ARE quite a handsome cat….but NOBODY likes to get jabbed with a needle so I think you were very brave. The little cat you met there sounds very sweet and I’m glad she has a Mom who is taking super good care of her……I hope you’ll be taking care of your Mom too if she’s getting sick – chicken soup is VERY good for humans (and a little lick is pretty nice for us too!!!!!). 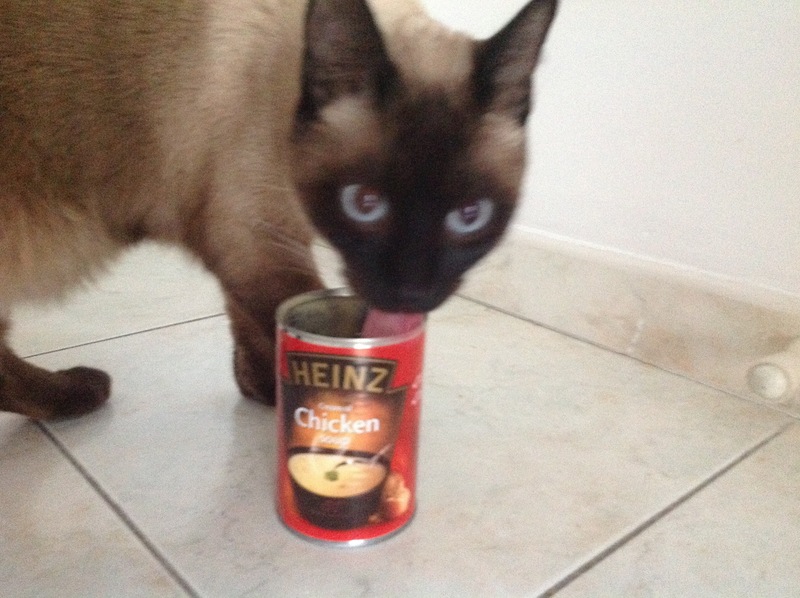 I hope you didn’t cut your tongue on that tin can. Those things can be sharp. 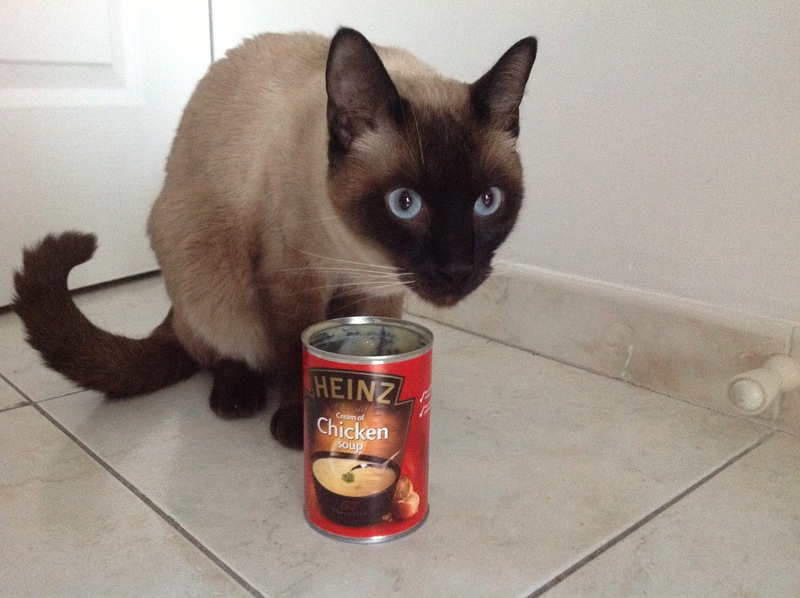 Chicken soup is good for you, humans and cats both! MaChatte doesn’t like to go away, she’s afraid in the car. But once she gets to the vet’s, she’s ok, and likes to explore till he comes in. She doesn’t even mind her shots much if I scratch her ears and talk to her while he’s doing it. Now you’re done for a while, yeaa! Glad that’s all over and done, Bailey. 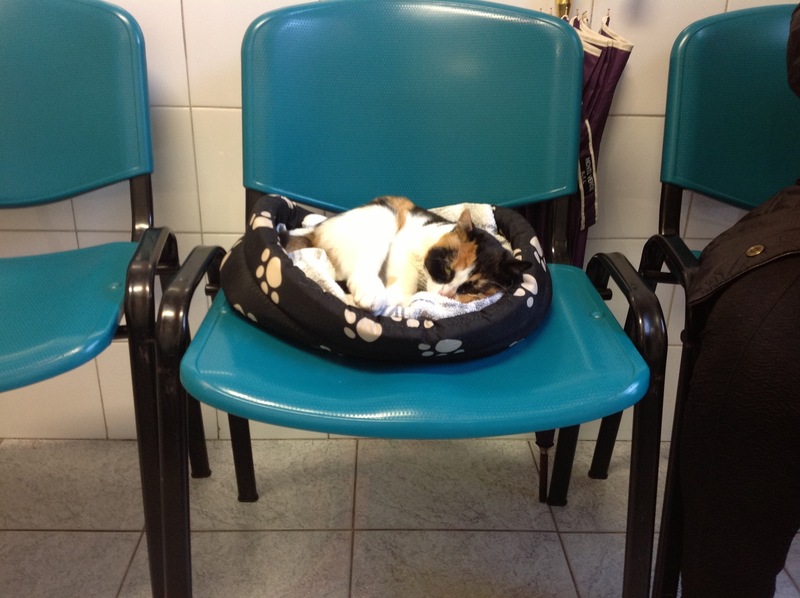 Oh, that poor little kitty in the waiting room… 😦 How wonderful that she has a family to love her. Be careful with that soup can: You don’t want to cut your tongue! Brave Bailey :). And what a cutie pie you met at the vet! Ugh, I hate going to the vet!